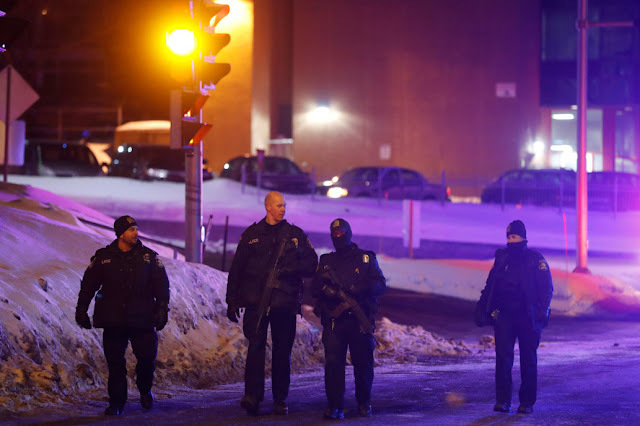 The suspects were identified as Alexandre Bissonnette and Mohamed Khadir, Radio-Canada reported. Police didn’t immediately speculate on a possible motive. One of them was nabbed close to the mosque – the Islamic Cultural Center — and the other was caught about nine miles away near l’île d’Orleans after calling 911, police Inspector Denis Turcotte said. A source close to the probe told Radio-Canada that authorities were investigating whether the two men attended nearby Laval University, which has many international students, many from French-speaking Africa. About 50 people were in the mosque when the shooting began at about 7:30 p.m. Sunday, police spokeswoman Coulombe said. The dead, all men, ranged in age from 35 to 60, police said. Thirty-nine people were unharmed. Five people were in critical condition and at least 14 others suffered minor injuries, according to the Centre Hospitalier Universite Laval, the National Post reported. Prime Minister Justin Trudeau described the attack as a terrorist act, which came amid heightened tensions worldwide over President Trump’s travel ban on several Muslim countries. “We condemn this terrorist attack on Muslims in a center of worship and refuge,” Trudeau said in a statement. “It is heart-wrenching to see such senseless violence. Diversity is our strength, and religious tolerance is a value that we, as Canadians, hold dear. “Muslim-Canadians are an important part of our national fabric, and these senseless acts have no place in our communities, cities and country,” he said. While police have not yet called the attack an act of terrorism, Quebec Premier Philippe Couillard echoed Trudeau’s characterization. Couillard shared a message of solidarity with Quebec’s Muslim community. “We are with you. You are at home. And you are welcome at home,” he said. Witnesses told Radio Canada that the masked men were wearing black “cagoules,” lightweight, hooded jackets. “It seemed to me that they had a Québécois accent. They started to fire, and as they shot they yelled, ‘Allahu akbar!’ The bullets hit people that were praying. People who were praying lost their lives. A bullet passed right over my head,” said one witness, who asked to remain anonymous. “There were even kids. There was even a 3-year-old who was with his father,” he added. Ali Hamadi, who had left the mosque minutes before, started getting phone calls telling him that it had come under attack. One of his good friends was killed. “He was my friend, my colleague. We worked together in the civil service for the Quebec government. Had I not left early, I could have been among the victims,” Hamadi told the Toronto-based Globe and Mail. When Hamadi went to the hospital and identified his friend’s body, all he could think about was the grief his pal’s wife and three young daughters will suffer. “Such a tragic event. How can his children ever come to grasp how their father could have been murdered while praying in a mosque?” Hamadi told the paper. He said he lay on his stomach as the man emptied his weapon. Then, he said, the gunman just stopped and left. The mosque’s president, Mohammed Yangui, who was not inside when the shooting erupted, said he got desperate calls from people at evening prayers, which usually are attended by 60 to 100 people. He said the attackers worked their way through two floors of the mosque, reloading as they went. The New York Police Department said it was stepping up patrols at mosques and other houses of worship. “NYPD is providing additional protection for mosques in the city. All New Yorkers should be vigilant. If you see something, say something,” Mayor Bill de Blasio said on Twitter. “Our prayers tonight are with the people of Quebec City as they deal with a terrible attack on a mosque. We must stand together,” Hizzoner said in another tweet. Prime Minister Justin Trudeau and Quebec Premier Philippe Couillard both characterized the attack as a terrorist act, which came amid heightened tensions worldwide over President Trump’s ban on travelers from several Muslim countries. Couillard said security would be ramped up at mosques in Quebec City and Montreal. Hours after the shooting, the Centre sportif de Sainte Foy acted as a hub where concerned residents congregated. Gazi Hamrouni had spent six hours looking for a friend of 20 years. He said no one was able to provide information about his friend, who wasn’t on the injured list. “He doesn’t work Sunday nights so this is the place he would be (the mosque) — he lives five minutes away from it,” he said. Abder Dhakkar and four other men were frustrated at the lack of communication with the families of victims. “Shouldn’t there be someone we can go to know what’s going on?” Dhakkar told the paper. Others at the center said they were there because they felt they had to be. The mosque has already been the target of hate. In June 2015, a pig’s head was left on the doorstep during the Muslim holy month of Ramadan. Other mosques in Canada have been targeted with racist graffiti in recent months, but Sunday’s attack came on the heels of the country’s vow to welcome Muslims and refugees after Trump’s action Friday sparked worldwide outrage and travel chaos.